With each passing year companies spend more than ever before on digital marketing services. The recent ban on cryptocurrency advertising on Facebook, Twitter and Google creates an entirely new and uncontested “Blue Ocean” market space with no competition. Webhits.io’s mission is to pioneer the technological development of this new industry by introducing a new generation of digital advertising solutions to ICOs, startups, blockchain companies and corporations. The rapid economic growth of the Asia-Pacific and particularly China, Singapore, South Korea, the Philippines, Malaysia, Indonesia and India attracts the attention of multinational companies. They want to enter these emerging markets to sell their products and services. Although, Asian social media networks like WeChat and Tencent QQ have become some of the largest and most popular globally, the rest of the world cannot advertise on them. On one hand, freelancers and small businesses cannot afford the much needed services of top social media influencers. On the other hand, many social media authority figures are unable to maximize their profits from existing followers. With the rapid growth of the blockchain technology the resources and tools available for mining increase by the day. In November 2017, The Guardian revealed that Bitcoin network’s estimated electricity consumption is greater than that of 19 European countries, consuming more than five times the produce of Europe’s largest wind farm. Unlike any other existing and relatively overpriced social media platform, Webhits.io offers 10 times cheaper advertising services. Much like Facebook, Twitter, Medium and Pinterest the Webhits.io is also interest-based. This allows sole proprietors, businesses and global brands to more effectively advertise their offers to a highly targeted countries of interest. Connecting with and capitalizing on interest-based audience will result in an increased ROI for advertisers. 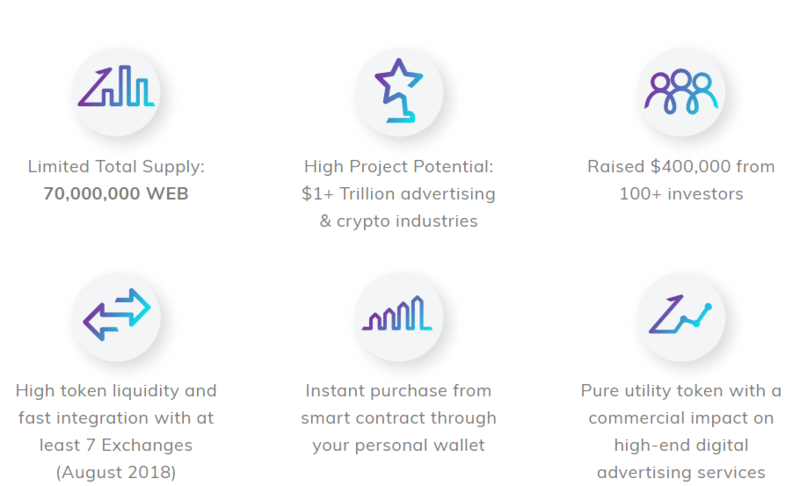 The Webcoin team aims to integrate all viral social media networks into the world’s largest interest-based p2p social media and web exchange platform. The Webhits.io platform will allow businesses from all around the world to effectively advertise also on the Indian and Asia-Pacific markets. The advancement of the Internet technologies allows millions of people worldwide to work remotely from virtually anywhere. The number of freelance marketplaces like Fiverr, Freelancer and PeoplePerHour is growing and so is the number of freelancers. It becomes harder and harder for a freelancer to stand out and earn money online. Webhits.io will encourage freelancers to offer a greater variety of social media and website related services. More services will lead to improved profile visibility, more clients, thus more income. Webcoin social mining requires almost no GPU and CPU, unlike Bitcoin or Ether. 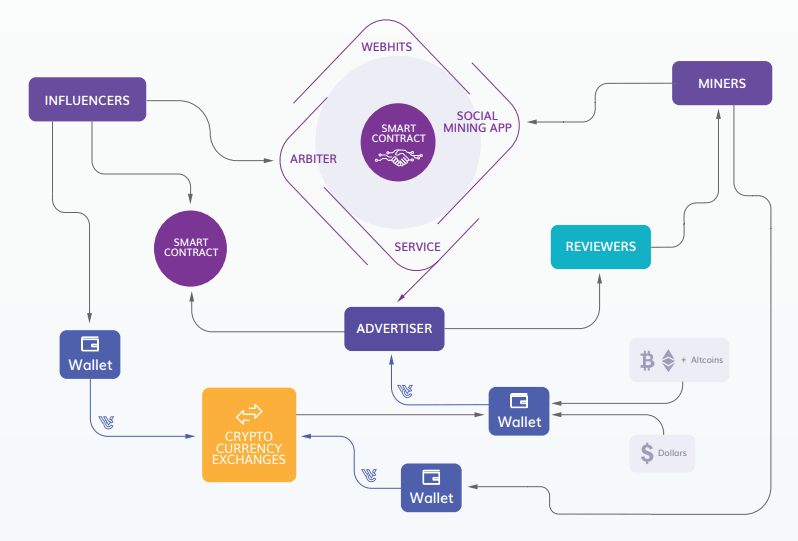 In order to engage in Webcoin social mining, miners need to visit websites and social media links submitted by advertisers to the Webhits.io platform. Every verified visit of an advertiser website and every advertiser-related social media action (e.g. like, share, follow) will be monetarily rewarded with a fixed portion of Webcoin token. All commercial processes occurring within the Webhits.io platform will be governed and regulated by the Webcoin team. Advertisers will receive an initial amount of Webcoin which they will trade for a certain amount of social media exposure. Upon receiving advertiser demands, the platform issues an offer to the appropriate miner. After the miner successfully delivers the service, the platform rewards him with a portion of Webcoin token. The platform will also retain a small portion of Webcoin from each transaction. This will be our team’s main source of revenue for maintenance and support. Buy directly from exchanges, which will generate demand for the Webcoin token and drive prices upwards. As some of the advertisers may not be willing to deal with exchanges and convert FIAT currency to cryptocurrency themselves, the platform will save them the trouble by re-selling Webcoin for USD$ at 5-10% above the average market rate on cryptocurrency exchanges.